This is a sponsored post written by me on behalf of Bestway. When it comes to summer and life in South Texas, we’re always on the hunt for ways to have fun with our friends and stay cool at the same time! For us, that means finding ways to keep cool in summer! And we’ve had a blast with our friends so far! With the temperatures heating up, we knew it was time to invite some friends over for some fun! So we got out our H2OGO! Water Slide and turned on the water! Instant fun! The kids loved the Speed Ramp™ which gave them a smooth launch down the 18-foot slide into the drench pool at the end. And with two lanes, the kids could also hold competitions to see who picked up the most speed while staying cool! The H2OGO! Water Slide was easy to set up and the kids were having a blast within minutes which gave the parents time to hang out a bit too! You can pick up an H2OGO! 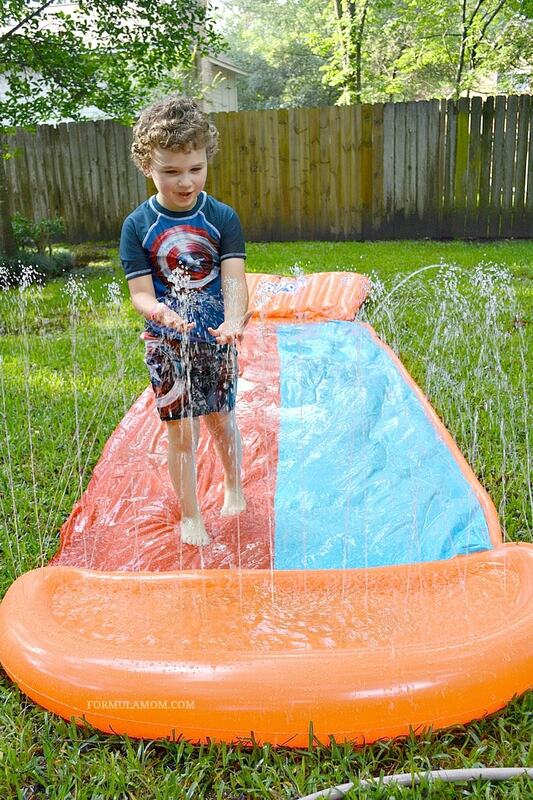 Water Slide of your own at Toys R’Us, Amazon.com, Target.com and Walmart.com! So pick one up to be the center of your summer cool down fun. 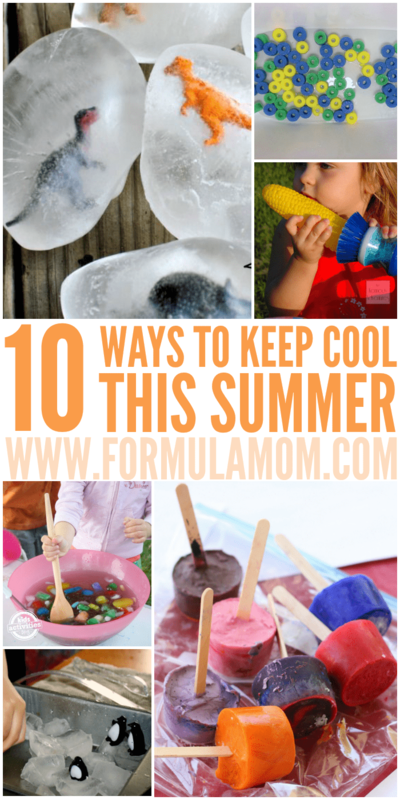 Then check out some more of our favorite ideas for staying cool during the summer! Become archaeologists for the day, and help your kids excavate dinosaurs from ice. Cool! Head outdoors to your patio or picnic table for an ice painting activity. What a great way to cool down and explore colors! 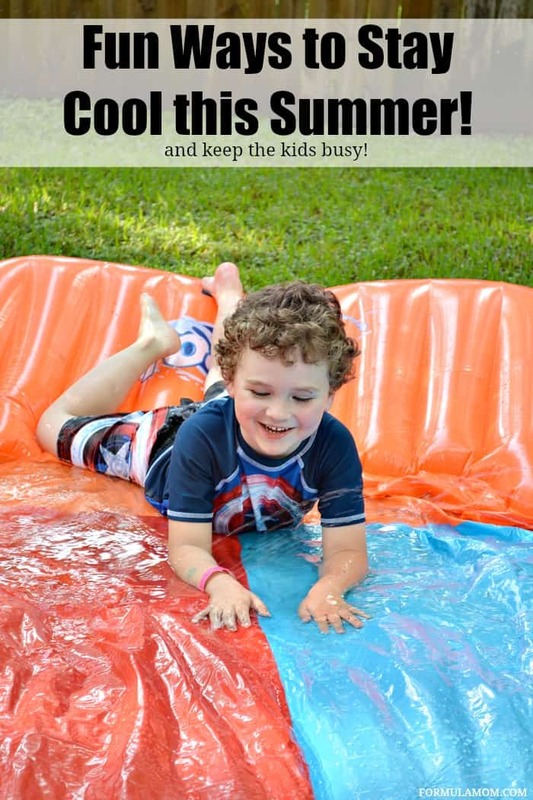 Take your kids’ toy fruits and vegetables outside for some water sensory play. You could also let them wash real fruits and veggies as long as no chemicals were used on them. When the temps outside are just too hot, head indoors and cool down with this pool noodle bath sensory activity. Learn about penguins and melting glaciers with this penguin ice melt science activity. 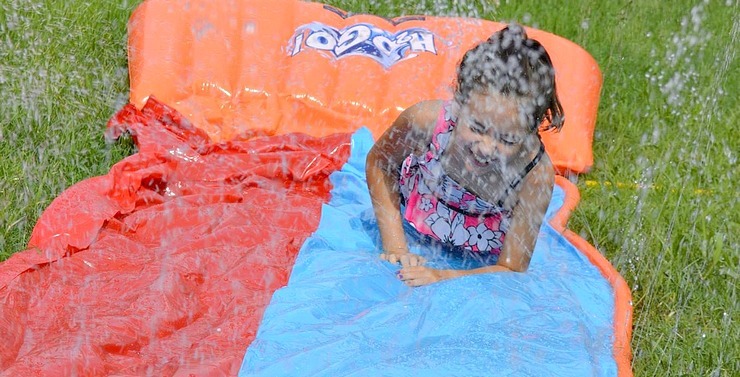 Last year we paired squirt guns with Kool­Aid to cool off and make fun tie­ dyed shirts. A water hose, a piece of rain gutter and some soap boats combine for a thrilling race and water activity. Switch out the water balloons for some homemade sponge balls for your next water fight! Pinatas aren’t just for birthdays! Tie a water bag (or lots of water balloons) up in a tree for lots of splashing and fun. Colored ice is simple and fun. Add some food coloring to your ice trays, put the colored cubes in a bowl of water, and let the kids play! I would love to invite over all my family and the kids to stay cool with me this summer! We have a lot of kids in our neighborhood, so we would let them all come over. We have a shady backyard, so the adults could sit in the shade while the kids all play. All of our toddler friends! I would invite my other two grandsons over. My one grandson lives her with his mom and we would have a blast playing on the slide. They love slides and they love water. I would invite my grandkids and my neighbor’s daughter. I would invite the neighbors daughter over to play with my 4 year old son. I would invite my granddaughter over to enjoy the water slide. My daughter and I would invite my nephew over for some fun. We would invite the neighborhood kids over to play! My boys would love this! !